Let's face it, QR Code hasn't been very exciting. Just dots and squares. 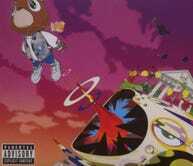 But this QR facelift, combining the designs of Louis Vuitton with Takashi Murakami, just made Kanye make a mess in his shoes.